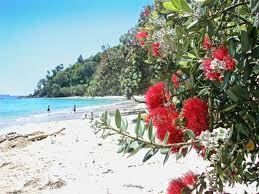 Its early December in New Zealand – before the Primary School holidays and the great NZ rush to the beach for the summer. 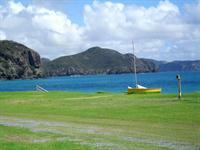 A great time to explore a few of Northland’s great off the beaten track beaches and waterways. The real NZ madness starts on boxing day 26 December. Then cities are quiet places to be – as there is a great exodus to the beaches and mountains where New Zealanders stay with friends, pitch a tent, book a bach (holiday home) until the end of January. When are NZ school holidays? So December you are clear of all that and right at the beginning of summer. Travelling with a Dog – Many small motels and campgrounds are happy to have dogs stay – as long as it is not in the summer school holidays. AA Travel for pet friendly places. 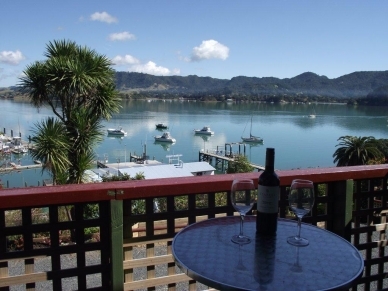 Half way between the Bay of Islands and Kaitaia, this quiet and sheltered harbour is off the main road, and unless you do the scenic drive around the coast via Matauri Bay, you will miss it. Whangaroa Lodge Motel is our base. I had visited once before and decided it was a must to return to, so here we are. The motel has been completely revamped by owners Derek and Sheryl with modern furnishings and décor. Each unit has an outside area to enjoy the view, and there are two BBQ areas to cook any fish you might have caught. All set in a beautiful garden, with steps leading down to the Marina and Hotel where great meals and a café sit beside the water. Dog friendly too – not inside, but the dog is very happy in our shaded verandah and wandering in the garden. To stretch our legs we walked down the garden steps and walked 10 minutes around the harbour to the end of the road, past the commercial fishing wharf and to check out the boat ramp from which we will later launch our kayaks. You can hire kayaks if you do not bring your own. Pohutukawa trees are starting to show off their red flowers which for all New Zealanders is the sign of summer and holidays. For me spring is the first spring lambs, and summer is those red pohutukawa flowers beside the water – beckoning us in for another season of enjoying the New Zealand coastline. There is a 5-10 knot wind, but in the harbour we can find sheltered spots, so we launch the kayaks and take the dog with us. She is not so keen, and we have to paddle hard around the point, but we are soon in a sheltered bay. 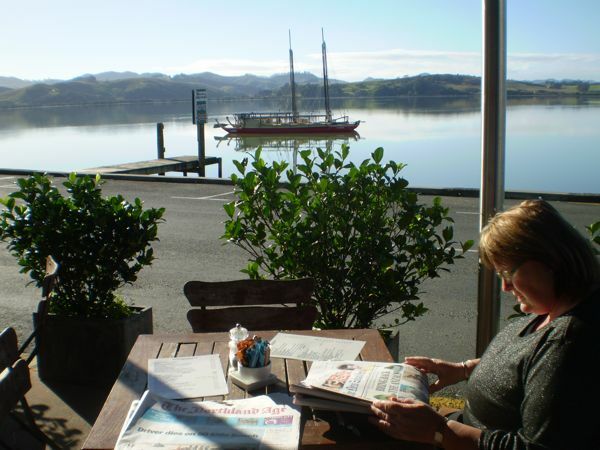 Two hours later we are back at the ramp in time for a coffee at Lukes Café at the Whangaroa Hotel – it does not open until midday early in the season, and we are there on the dot. It is just 12 kms to our next stop at Tauranga Bay where we have used Bookabach to find a place to rent for a few days. Bookabach is a great place to find a holiday house to rent. The place as promised looks out over a reserve to the water. 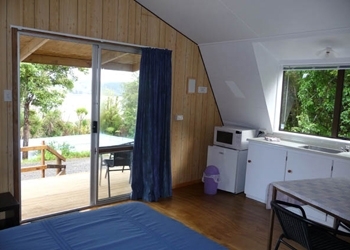 A simple 3 bedroom bach – no pretentions, just a great place to chill out and enjoy the beach. The deck looks over the sea and off shore islands. We open the doors and blinds and unload the car – a few more things like linen and pillows needed, but its worth it. In an hour the beds are made, the fridge loaded up (a small shop at the campground only) and the ipod is on – this place is ours for three nights. We decide on early morning kayaking before the wind is up – we are on the water by 7.45, or in my case IN the water as I got totally drenched getting in and out of the kayak – my first ‘swim’ of the season. My companion Liz just laughed! We turn south and paddle around the coast and the rock outcrops that are the islands here. The water is crystal clear, the fish jump around us, the gannets are fishing – every few minutes we stop and breathe in the view. It is stunning and we are the only ones on the water as far as the eye can see. Later in the day we have our first real swim – the first swim of the season is always a challenge, but once in it was great – promise of a great summer to come. Our drive to Ahipara takes us into Doubtless Bay – first stop the Waterfront Café at Mangonui for coffee (it is my favourite) overlooking the harbour. Then it’s the Saturday market in the hall, then a browse of the shops – the flax one is a must but there are a few beauties along the main street of old houses. The finale is fish and chips at the Mangonui Fish Shop – Liz had snapper, I had peppered squid with chips and a prawn cocktail, with a beer to wash it down. This is a seriously good meal. A dog friendly place to sit – a water bowl to prove it. I suspect it is also for smokers, but we were on our own. At Ahipara Holiday Park we are in a small cabin with mini kitchen and mini bathroom – no frills but all you need. Next door is a huge space for the dog to run around, and she has a friend – a huntaway cross, they happily chase each other around the paddock, which I suspect in January is full of tents, but at this time of year it is just a dogs paradise. Walked to the beach – a strong wind awaits us, but the big flat sand calls us on and we walk into the wind knowing that on the way back we will get a little assistance! A flat tyre x 2 greets me – hassle hassle – excellent coffee from The Gecko in Kaitaia as we wait for the car. VERY IMPORTANT – on the map the journey to Kohukohu looks quicker another way, but unless you are a mountain goat my advice is to go via Broadwood, otherwise it is a very hilly ride over the Mamamuka hills. It is also a great trip on the Ferry. 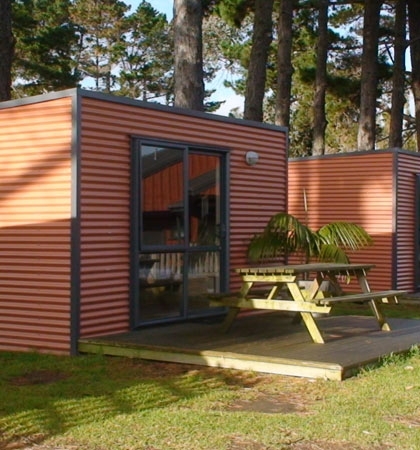 We drive out of town to find Rawene Motor camp set in the bush overlooking the harbour, it’s a great spot. About 10-15 minutes walk to the village and the Café over the water. The tide is good – coming up to high tide, so it helps us on our way to Kohukohu, unfortunately a head wind makes it hard work, the dog snuggles into Liz and we put our backs into it to cross the bay to some shelter. We pass two shags sitting sentinel on some rotting old wharf posts – the harbour seems to have dozens of old wharves like this. I realize of course that water was for hundreds of years the main form of transport here. Going around the point we will be heading into the wind again, with the tide against us, it proves to be a challenge until we are across into calmer waters. We start to wonder how far it is to Kohukohu – I think it is around the next point, which is kind of true – the point is rather larger than I thought. Finally we see the wharf in the distance and we decide to press on, another 20 minutes and we realize we have no choice. We have been going 2 hours and need sustenance. We pull into the mangroves at Kohukohu with a huge sigh of relief – the dog gladly bounds off the kayak. We are soaked but warm and happy and looking forward to lunch – luckily we find a place where we can drip happily as well as enjoy a hot coffee. The Waterline Café has moved – used to be over the water, and now – thankfully still open across the road, some great art shops next door. The paddle back takes us half the time as the wind and tide are with us and we are fuelled up. The germans have taken up our suggestion and greet us with a strong kia ora as they arrive at our campground. A hot shower and a sleep…..
Driving home we are content – we have had a great week relaxing and exploring some of New Zealand’s great off the beaten track spots. The dog and us have had a perfect holiday.